Remove dirt, grease, and wax build-up to reveal your wood’s natural radiance. All it takes is one easy step to clean and shine finished wood furniture and cabinets. Rotate nozzle to ON position. 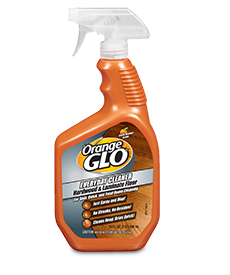 Apply Orange Glo™ onto a soft cloth, then clean and polish surfaces. Always test in an inconspicuous area first. 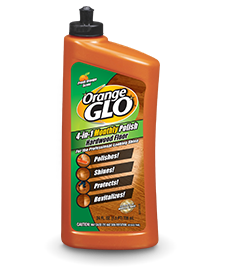 For heavy cleaning and moisturizing, or removing wax build-up, let Orange Glo™ stand for up to 5 minutes before wiping. 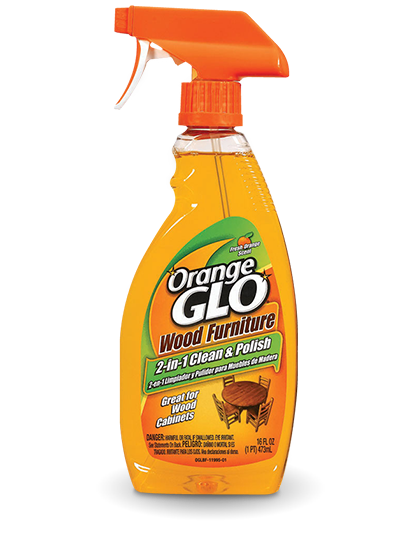 Please note that Orange Glo™ may darken natural wood finishes. Not for use on unfinished or lacquered surfaces, teak or damaged finished wood. Not for use on wood floors, stairs or shower floors – may make slippery. DANGER: Contains petroleum distillates. Avoid prolonged contact with skin. Wash with soap and water after use. If swallowed, do not induce vomiting; call a physician immediately. If in eyes, flush with water for 15 minutes; get medical attention if irritation occurs. Keep away from heat or flame.